SUMMER! It’s everyone’s favorite word. The sun is hotter, the days are longer and the pools and beaches are open for business. Get ready for summer entertaining with pool accessories, grilling gear, outdoor décor and other affordable ALDI Finds. Our ALDI Finds are non-food products, usually seasonally-relevant, that are available in-store for a limited period of time. Be sure to stock-up as we’ll be carrying what you need to enjoy every bite of summer. 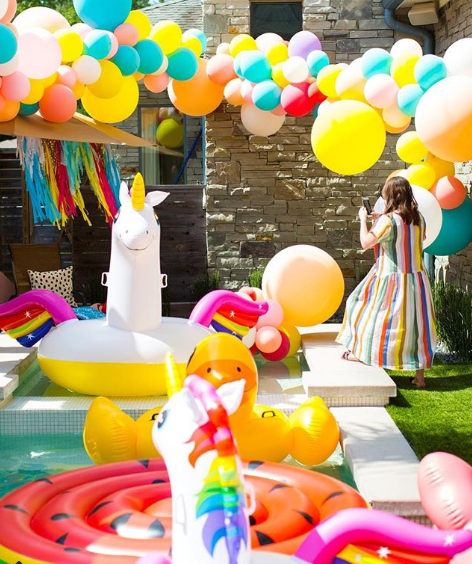 We worked with Sugar & Cloth to host the most epic pool party featuring some of our ALDI Finds! Sugar & Cloth set the scene at a gorgeous Houston, TX home. 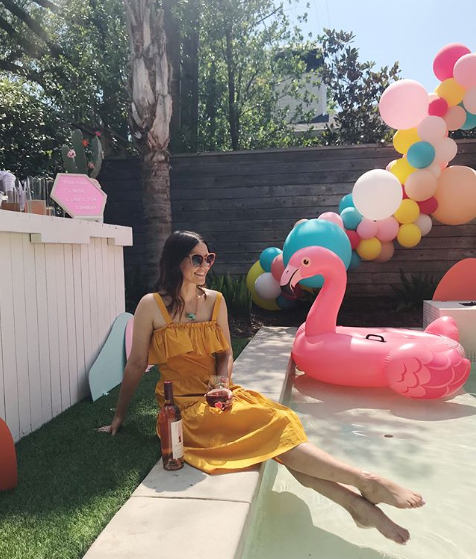 No summer soirée is complete without guests to fill the pool, so we invited a few social media A-listers to enjoy our summer event. We countered the Texan 90-degree heat with our tastiest summer foods and sips, (rosé for under $7, hello!). Guests enjoyed charcuterie boards featuring our award-winning cheeses, mini corndogs and sliders featuring our Earth Grown veggie burgers. A mixology bar tendered by Robin Berwick of the popular Houston bar Double Trouble, allowed guests to craft specialty cocktails and create fun fruit garnishes. 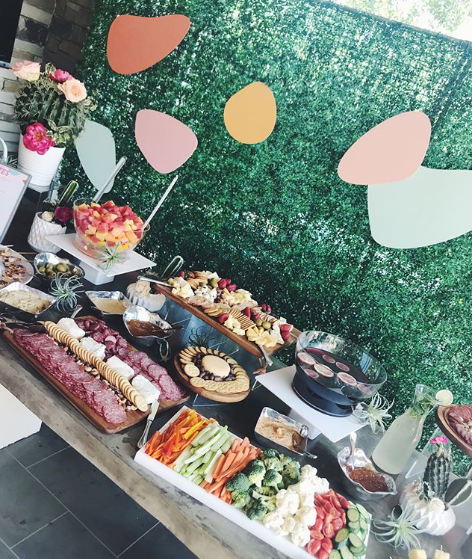 Summer days are long, but the season is short, so use our entertaining guide filled with tips and trends to inspire your own Instagram-worthy party! Don’t forget to stop by your local store to nab all of our summer ALDI Finds over the next few weeks. 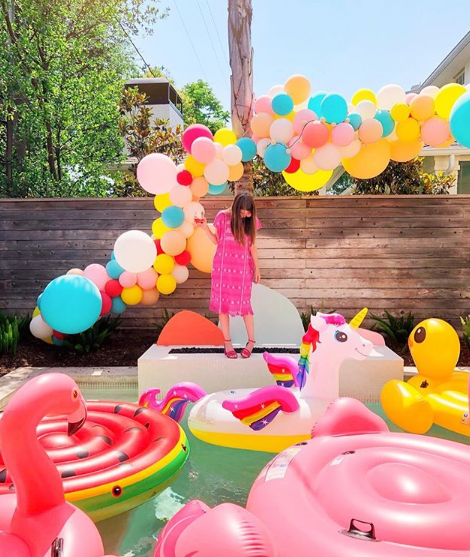 Nothing makes a big splash like colorful, whimsical pool floats! Fill your pool with an assortment. Whether you prefer a relaxing ride on our Intex Inflatable Ride Flamingo, (in stores 6/13 for under $8), or to float with friends on our Intex Mega Island Unicorn, we have inflatables for everyone. We also have other hot pool accessories that are party must-haves, including a H2OGO! Triple Slide with Speed Ramp, Toy Box Pool Bombz and a Crane Mist N Sip. Build in a break from partying in the pool with a relaxing oasis. Guests can jump out of the pool and into one of our cozy Huntington Home 30” x 60” Beach Towels.They come in vibrant colors and patterns. Bring out a few Crane Folding Sun & Sport Chairs for relaxing under the sun. For those guests who want more shade, our Crane Pop-Up Sun Shelter is the perfect hideaway. All of these items will be in stores beginning 6/13. All of the party excitement can work-up an appetite. Have plenty of handheld, snackable foods so guests can graze as they mingle. Build a next-level charcuterie board with our Crofton Acacia Cutting Boards, in stores 6/20, using delicious meats, cheeses, olives, nuts and preserves. We also recommend our seasonal snacks like Little Salad Bar Potato Salad or Happy Farms Preferred Cracker Cut Cheese. It’s important to stay hydrated in the heat, so keep plenty of drink options at the ready. In stores 6/13, use our Crofton Beverage Tub to store soda for your guests. Cool down by pouring PurAqua Sparkling Flavored Water in a Crofton Infusion Pitcher, in store 6/20, complete with fresh fruit. For the main course, grill summer favorites that can feed any sized party. 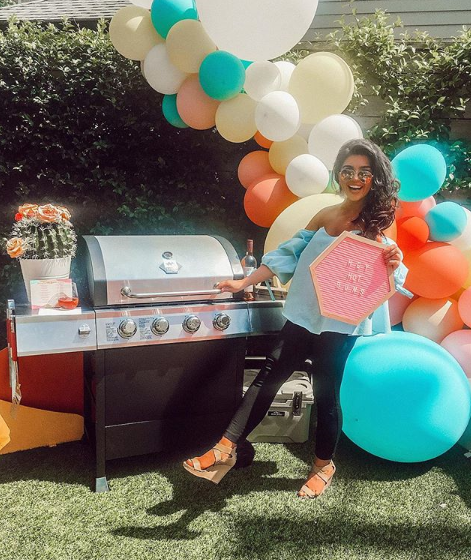 Our grills, (like the Range Master 4 Burner Gas Grill below), are perfect for summer outings. If you missed the 4 Burner Gas Grill at your store, mark your calendars for 6/13 when the Range Master 30” Barrel Grill With Smoker hits shelves. The offset smoker can be used for smoking or indirect cooking and has a slide-out charcoal tray. For something sure to impress, try our Sea Queen Shrimp Skewers. Use the grilled shrimp in a light recipe like Margarita Grilled Shrimp Tacos. For a decadent dessert, create an ice-cream bar with Sundae Shoppe vanilla, cookies & cream or Neapolitan ice cream complete with whipped cream and sprinkles. Have a raffle with your guests earlier in the party so one lucky friend can win a gift basket of our award-winning Trestoria Rosé and other summer finds. Need some suggestions? Crofton Double Wall Summer Drinkware, the iTECH Fitness Watch, or the Crofton Floating Wine Glass in store 6/27 would all make you guest’s day! Have a great summer gathering! Remember to check back at your local store for new ALDI Finds throughout the season. Hi Charlene – We want to be close to as many of our loyal shoppers as we can! We’ll share your suggestion with our real estate team. Thanks! We can’t find your Clancy’s Sea Salt and Black Pepper Potato Chips for some time now. When I ask an employee I am told it’s a warehouse issue. How can I get them now? It would be wonderful to have an aldi in deltona, many people would appreciate it. Thanks for reaching our Reinaldo. We will forward your suggestion to our real estate department.